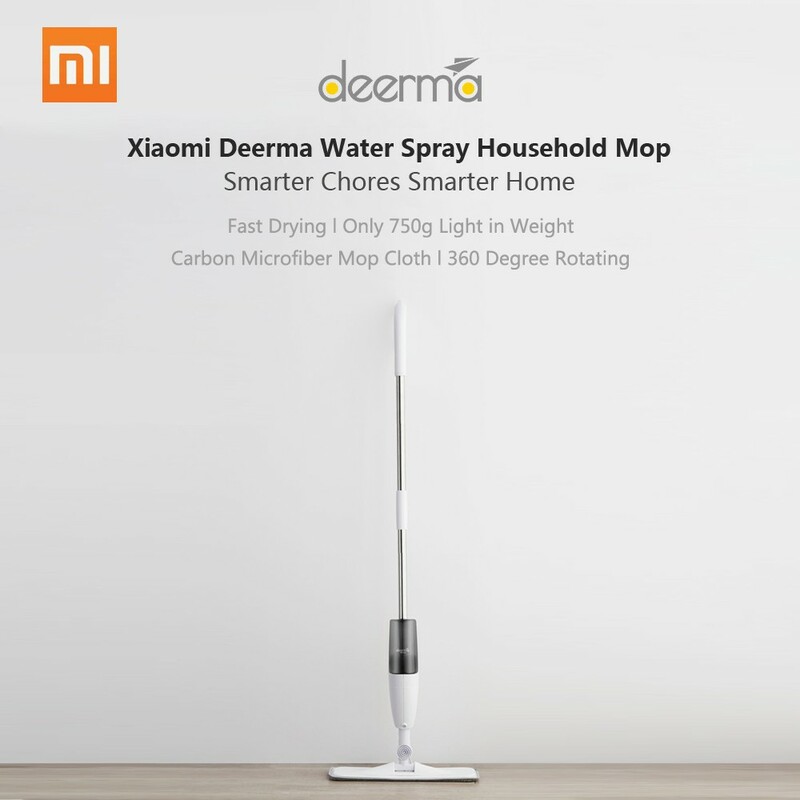 Xiaomi Deerma Water Spray Household Mop Smarter Chores Smarter Home. 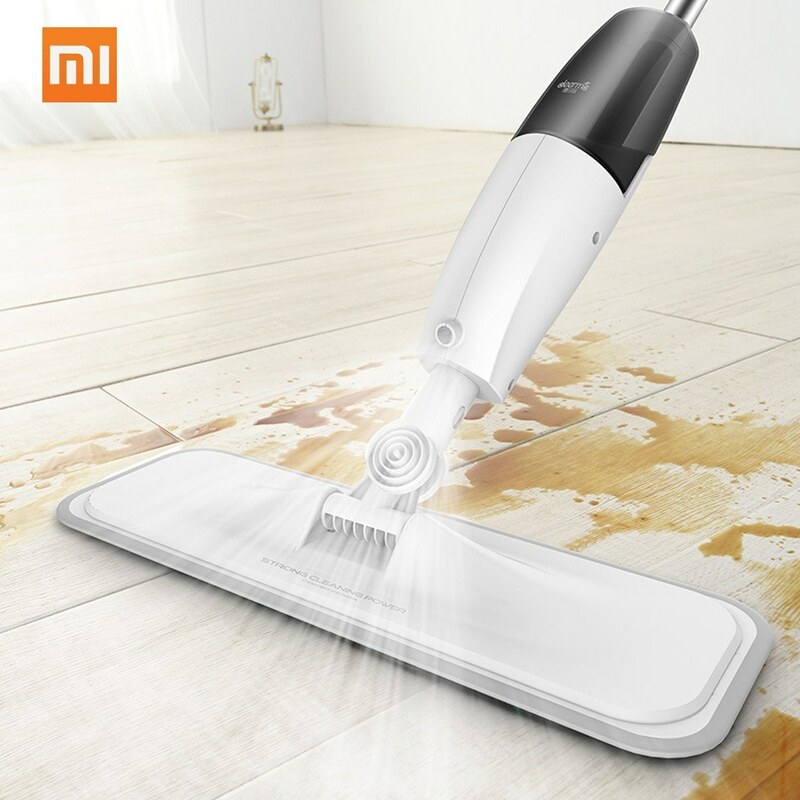 Comes From Xiaomi Eco-chain Deerma, No Xiaomi Logo on this item. 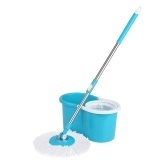 This water spray mop offers an easy and efficient way of cleaning. Not only is it fast and effective but it can also be used to clean various types of floor surfaces such as ceramic, hardwood, laminate among others. Easy to control. 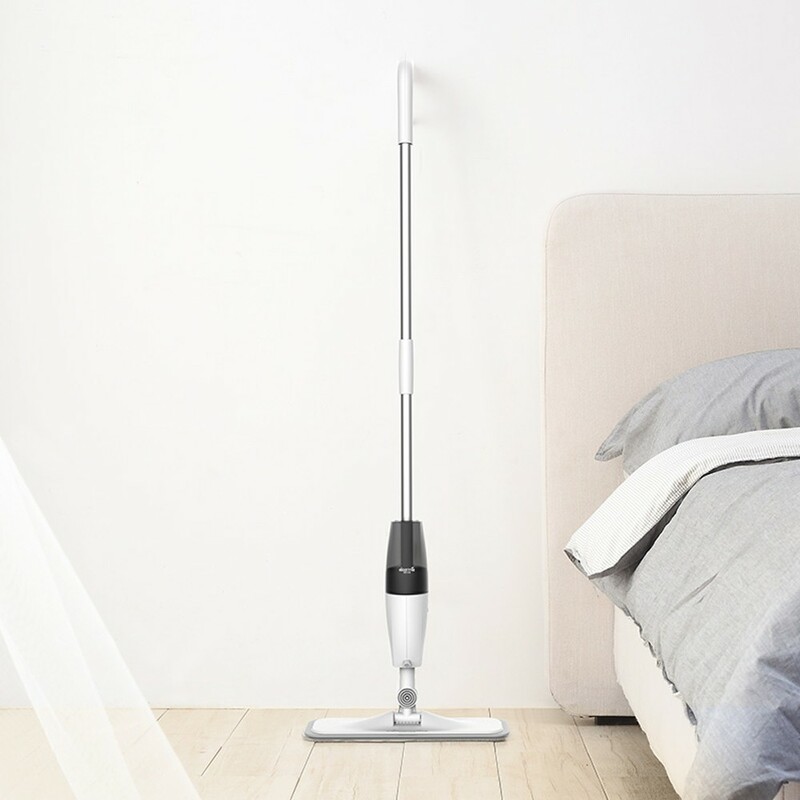 flexible enough to access corners and squeezed areas such as under the table, sofa, bed among others. No need of electricity. 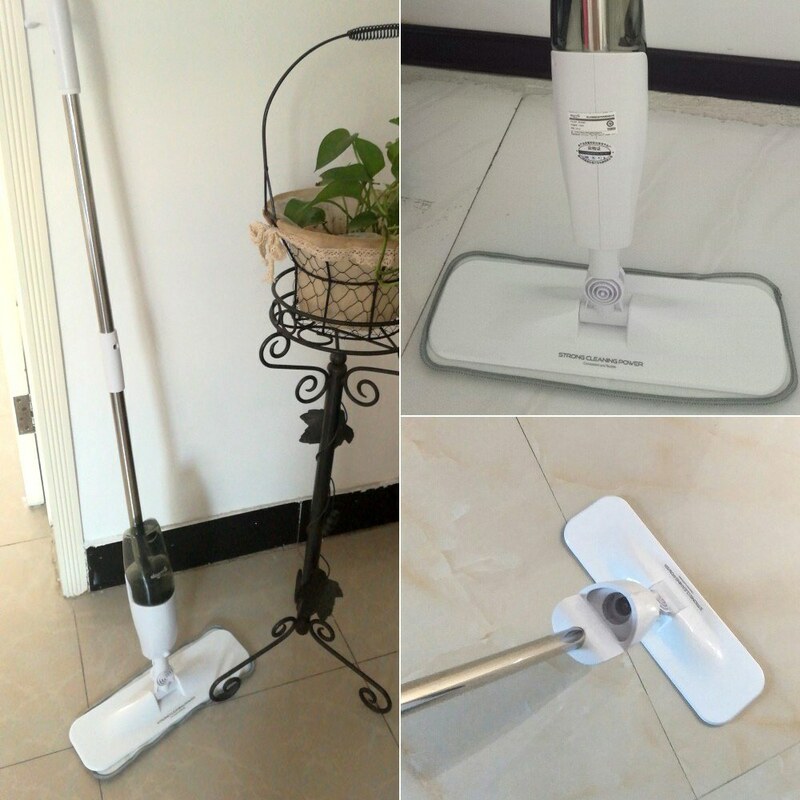 Furthermore, you don’t have to carry a bucket around since the mop has an inbuilt 0.35L Water Tank, Once Load for 100㎡ Area cleaning, Nailed it!. 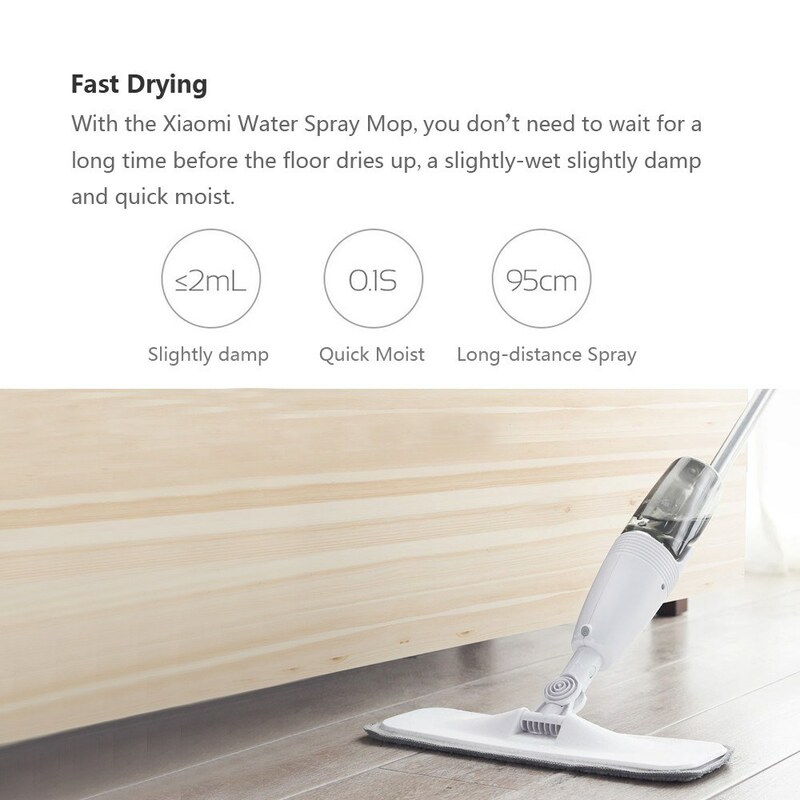 With the Xiaomi Water Spray Mop, you don’t need to wait for a long time before the floor dries up, a slightly-wet slightly damp and quick moist. 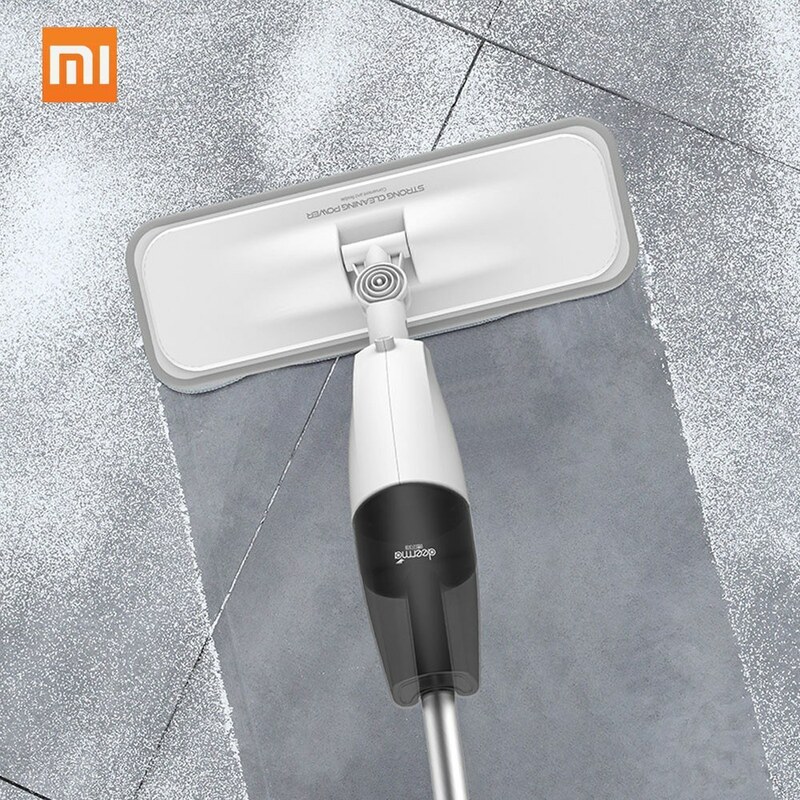 Xiaomi Mijia water spray mop offers the right amount of dampness which instantly dries up after the mop is dragged away. 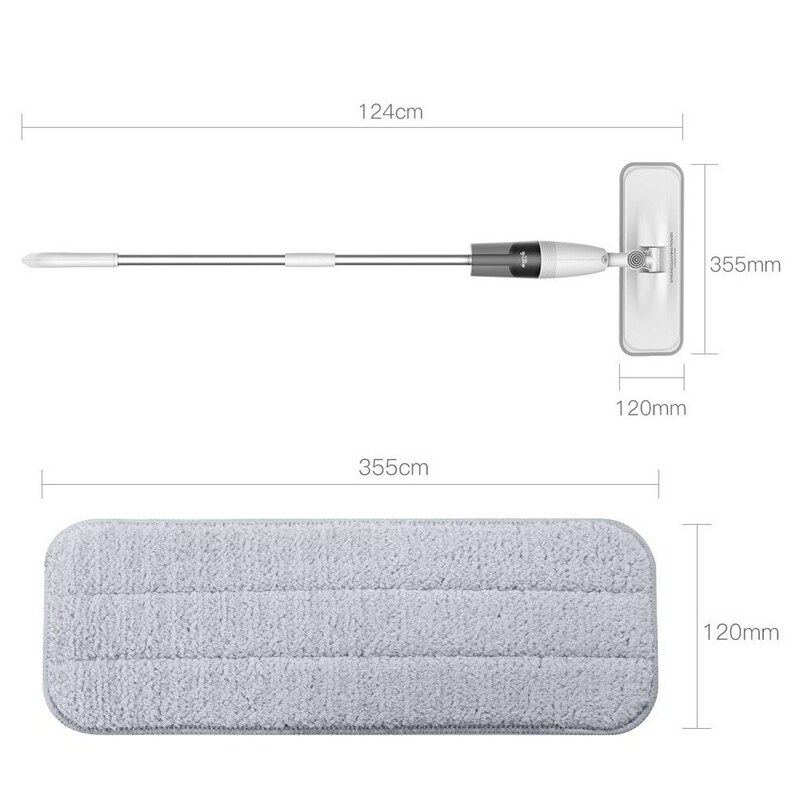 The mop’s rod can be adjusted so that the press spray area can reach 95 cm. 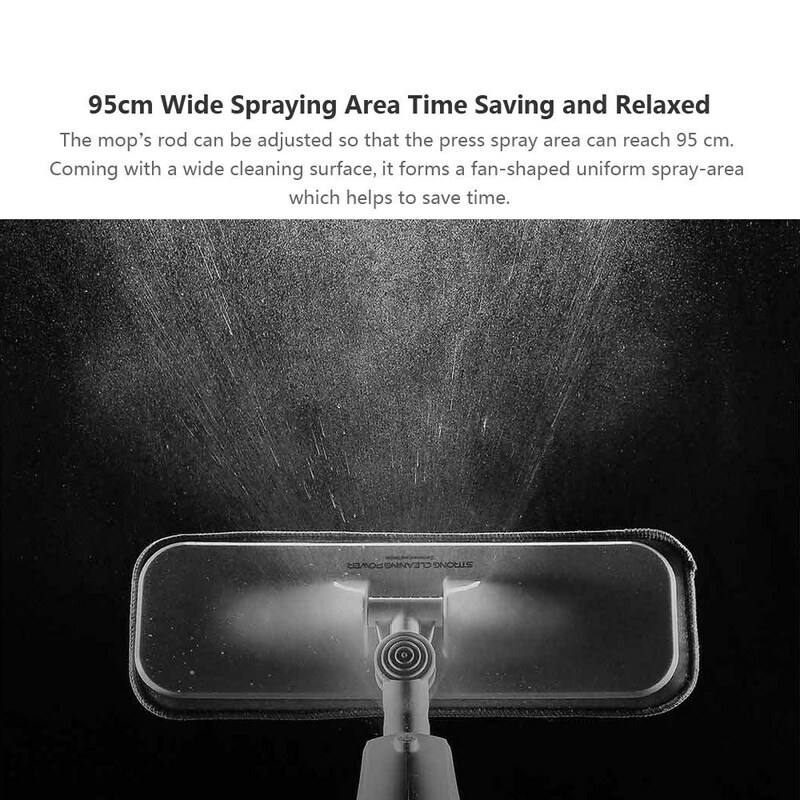 Coming with a wide cleaning surface, it forms a fan-shaped uniform spray-area which helps to save time. 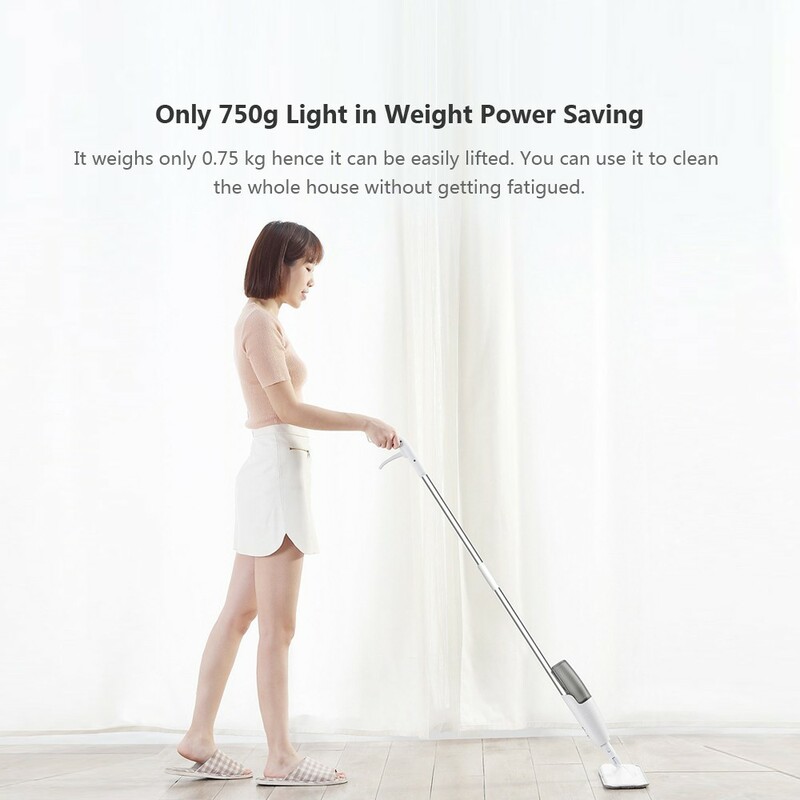 It weighs only 0.75 kg hence it can be easily lifted. You can use it to clean the whole house without getting fatigued. 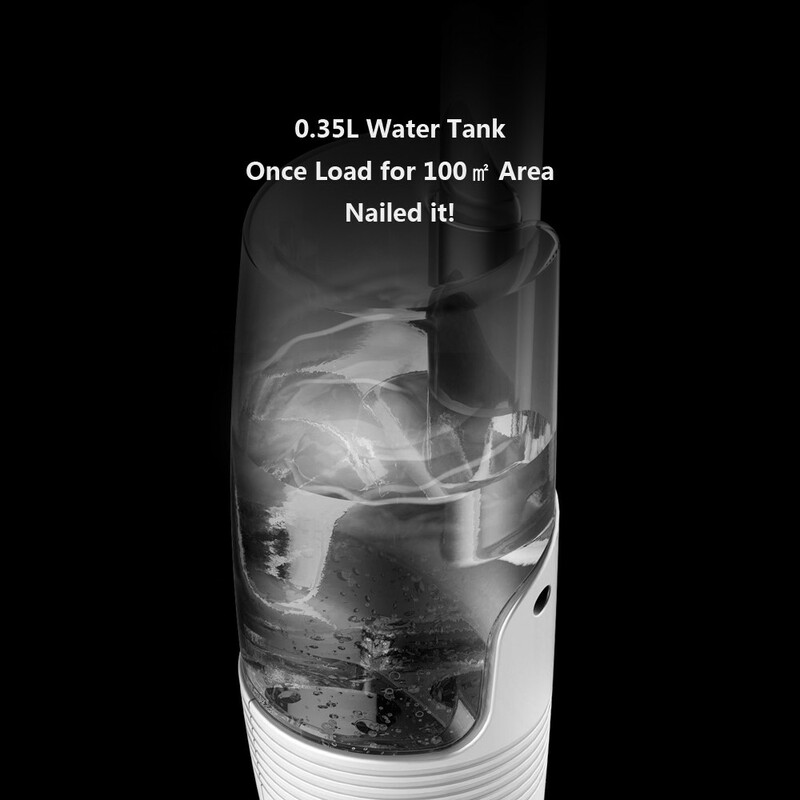 ● 0.35L Water Tank, Once Load for 100㎡ Area, Nailed it! 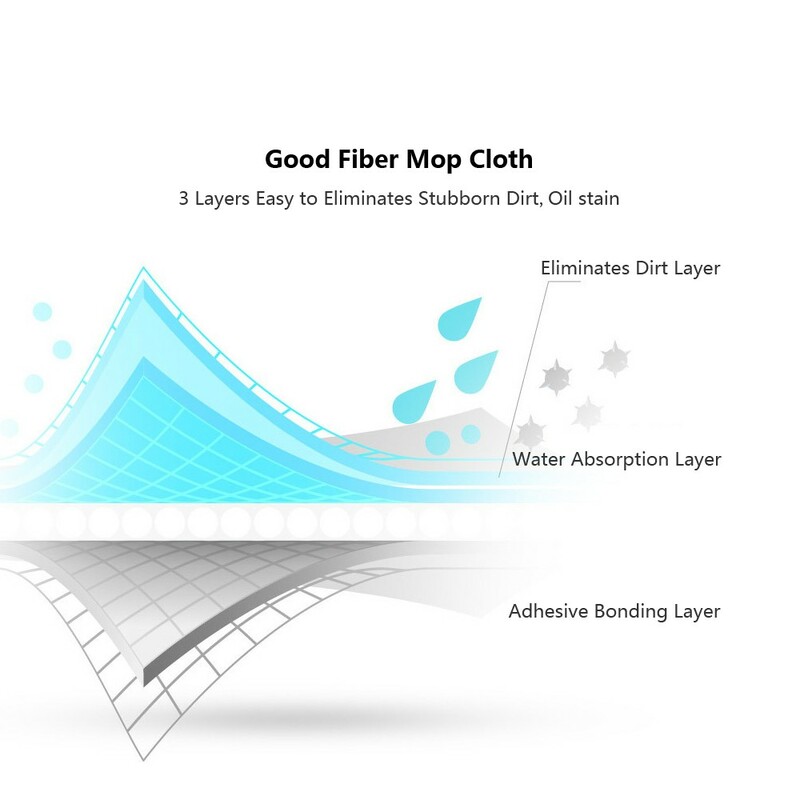 Perfect mop to eliminates even the most stubborn dirt, oil stain, pigment in hard-to-reach corners of your home easily and quickly. 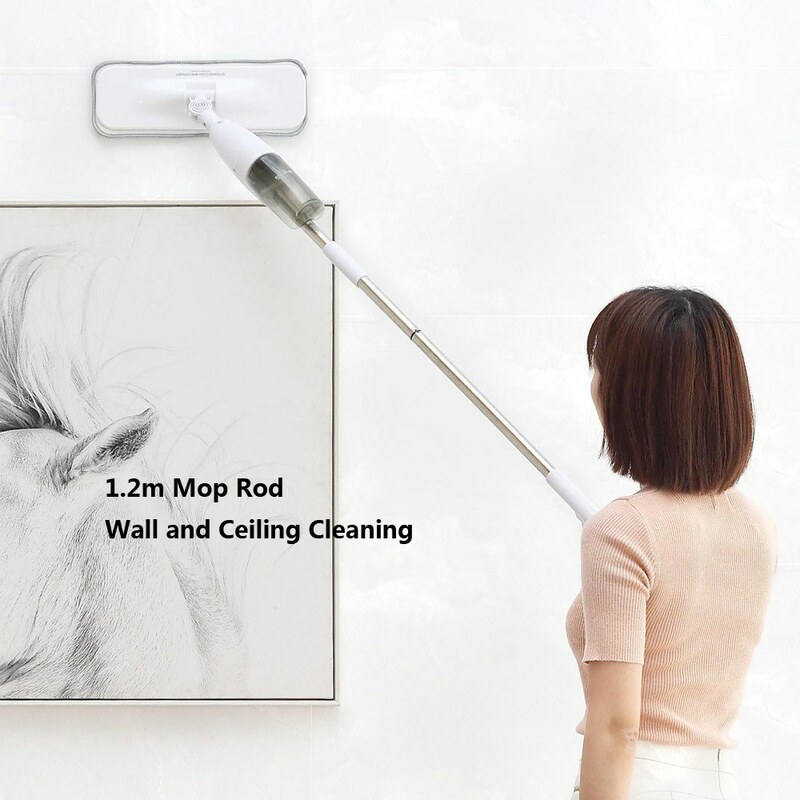 ● 1.2m Mop Rod, Wall and Ceiling Cleaning. 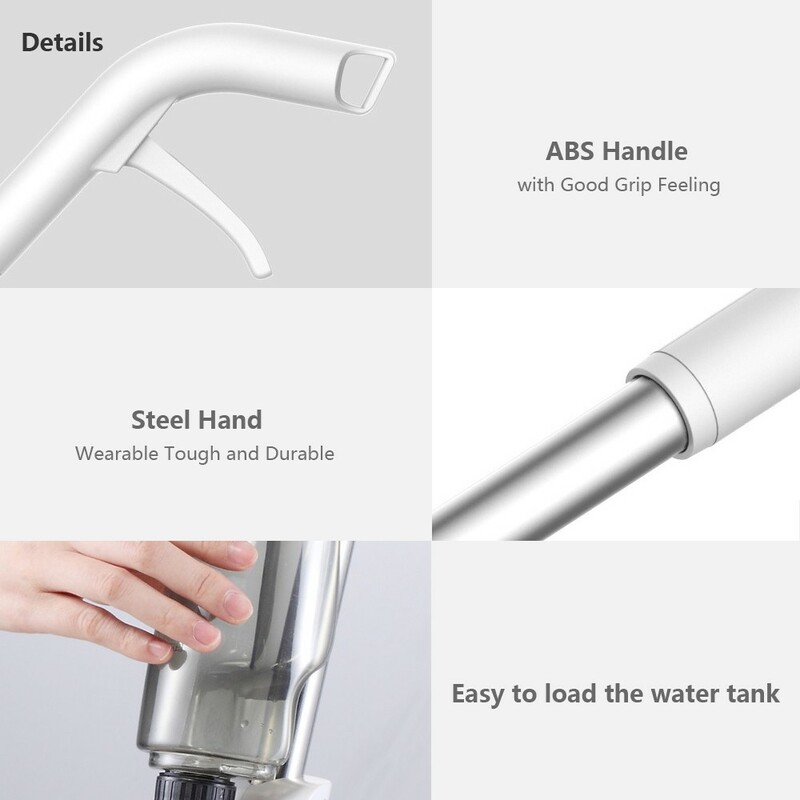 ABS Handle with Good Grip Feeling, Steel Hand Wearable Tough and Durable, Easy to load the water tank. 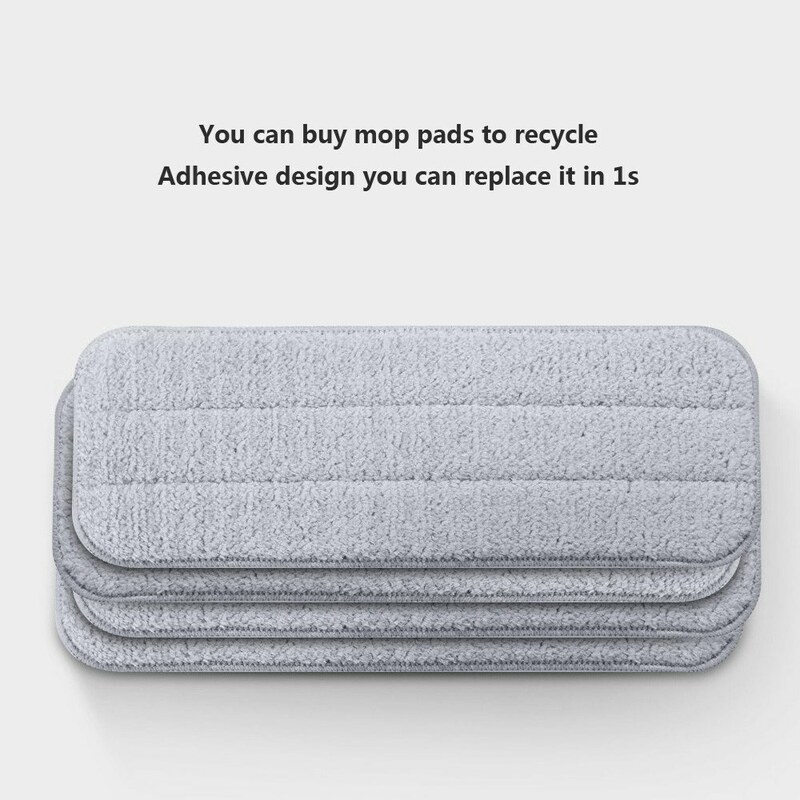 ● You can buy mop microfiber pads to recycle adhesive design you can replace it in 1s. Q Hi! 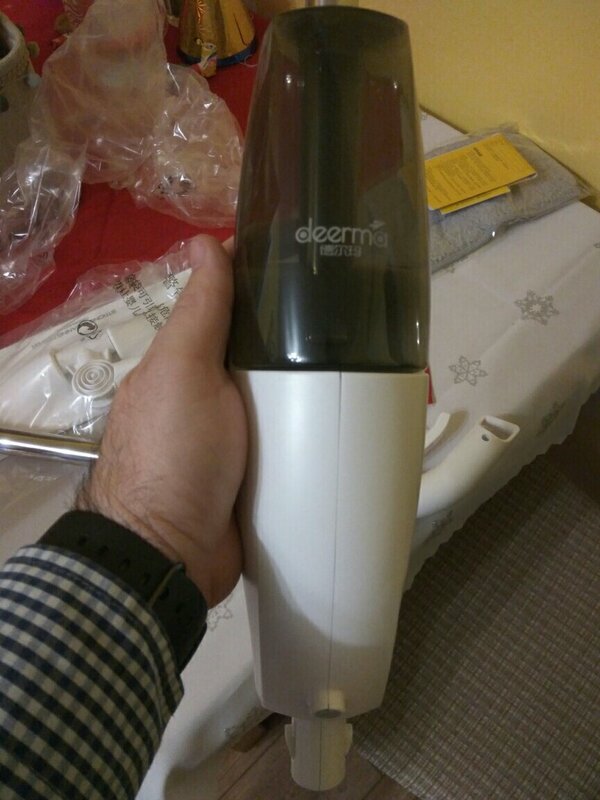 Can fill bottle with hot water or at least 50 degree (max temp that my storage tank allows) ? And can fill bottle with detergent or water only ? Thank you. A Yes , of course it can. 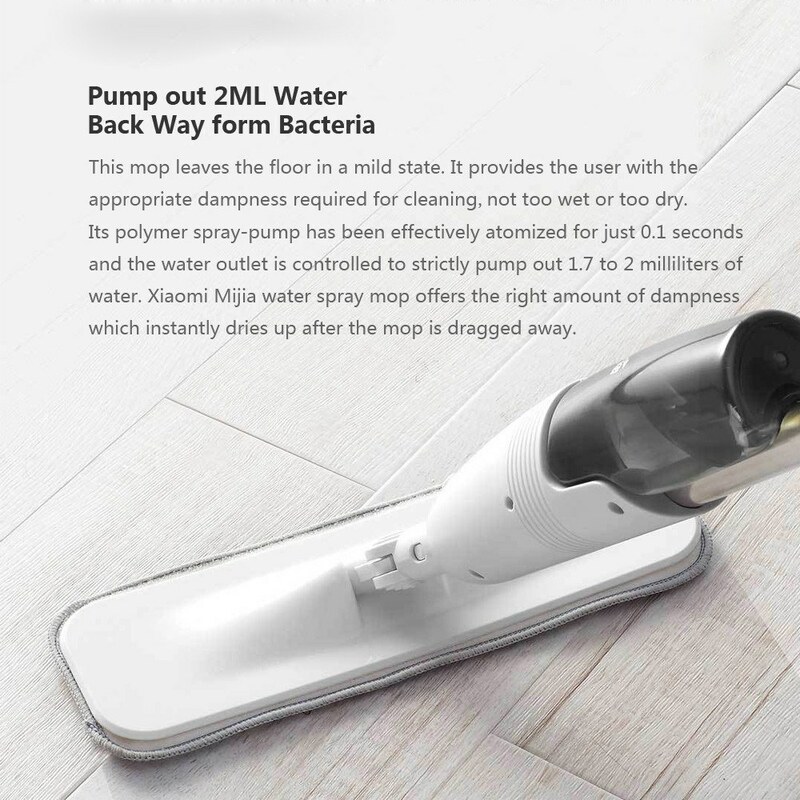 It can fill bottle with detergent or water ， thanks . 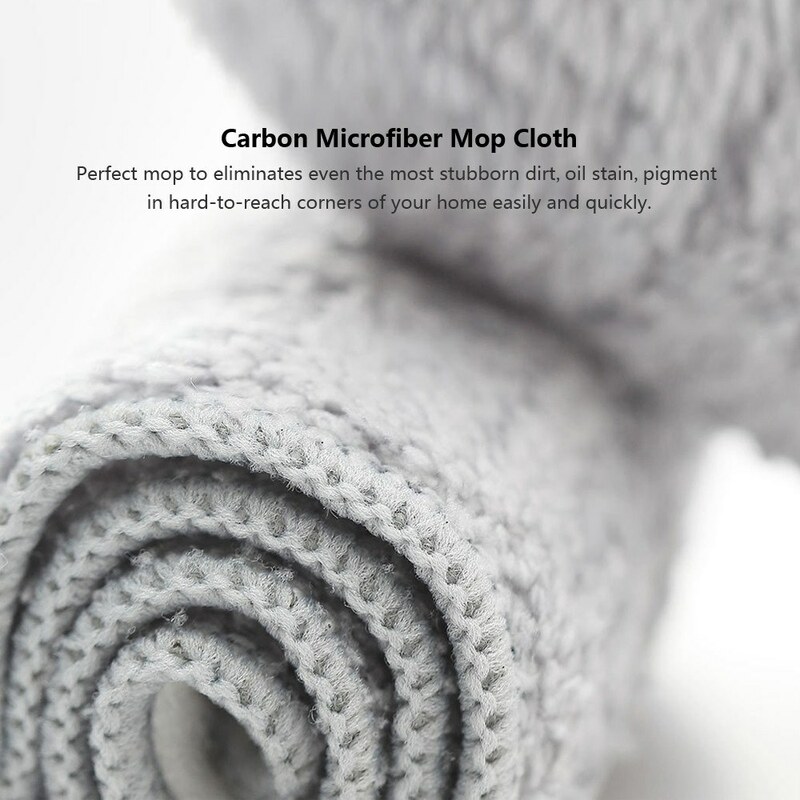 Q Can we wash Carbon Microfiber Mop Cloth in the washing machine or only manually ? 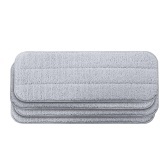 Q Is the micropad reusable and machine washable? A Descriptions Xiaomi Deerma Water Spray Household Mop Smarter Chores Smarter Home. 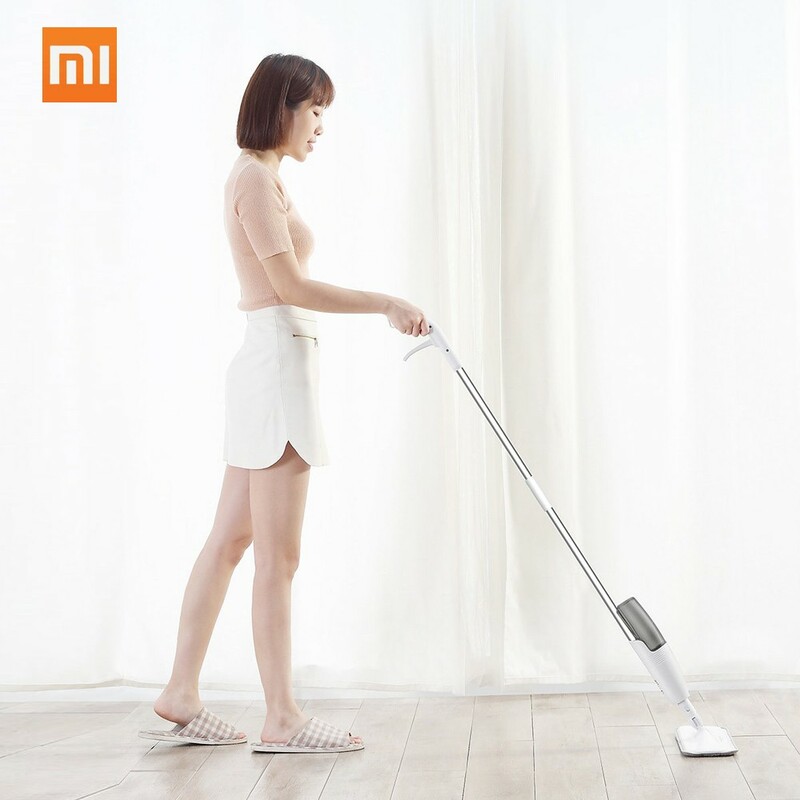 Comes From Xiaomi Eco-chain Deerma, No Xiaomi Logo on this item. 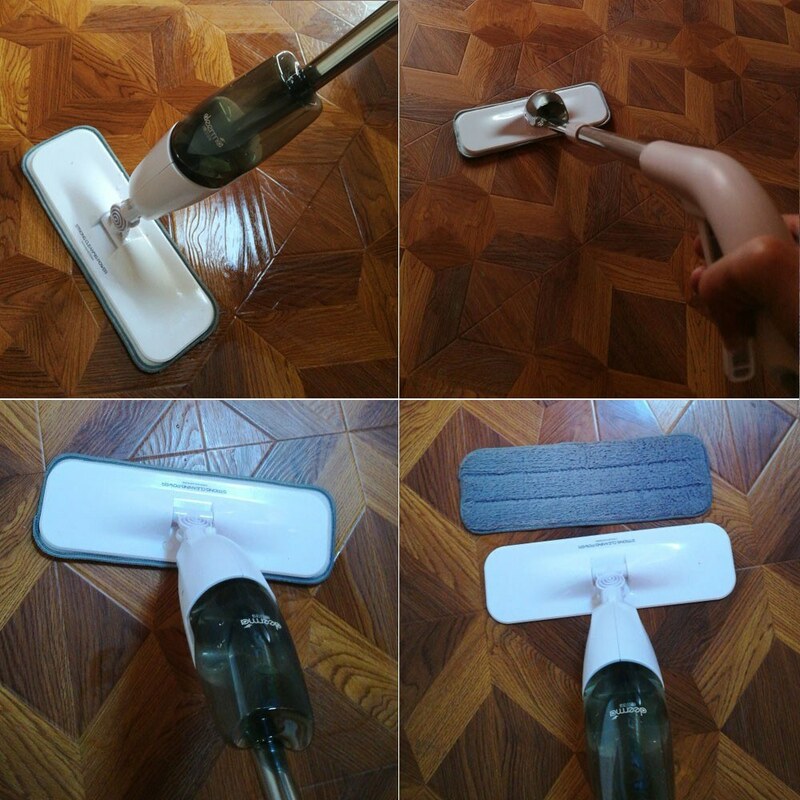 This water spray mop offers an easy and efficient way of cleaning. 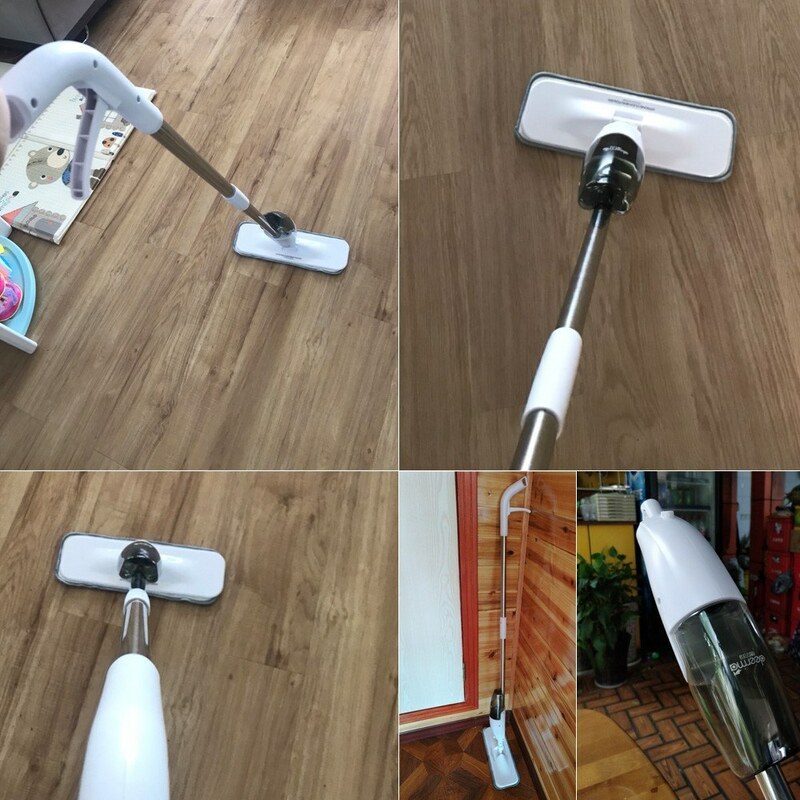 Not only is it fast and effective but it can also be used to clean various types of floor surfaces such as ceramic, hardwood, laminate among others. Easy to control. 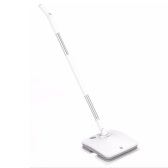 flexible enough to access corners and squeezed areas such as under the table, sofa, bed among others. No need of electricity. 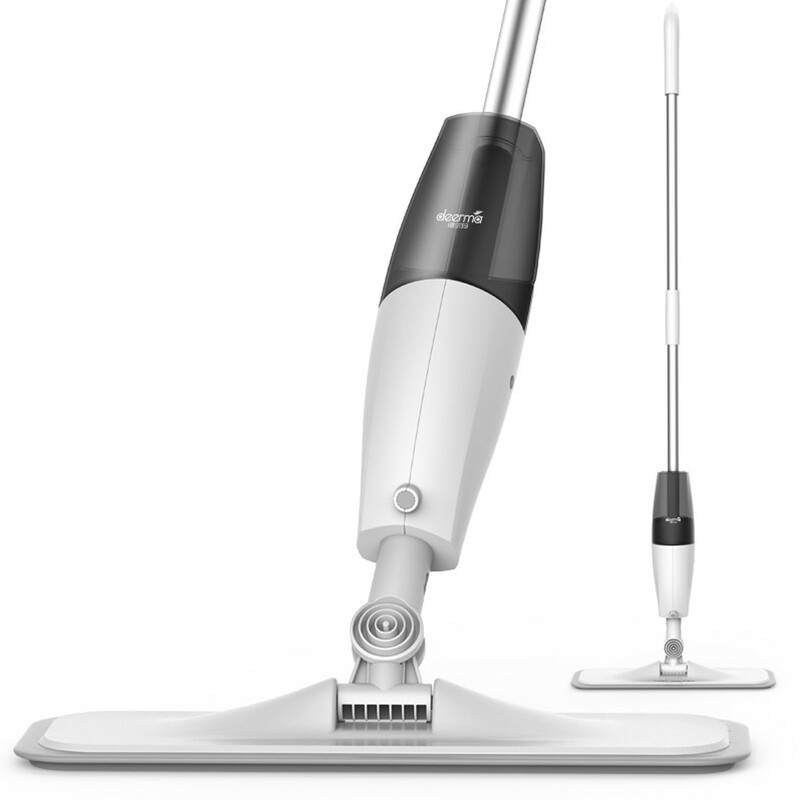 Furthermore, you don’t have to carry a bucket around since the mop has an inbuilt 0.35L Water Tank, Once Load for 100㎡ Area cleaning, Nailed it!. Fast shipping! Very good Xiaomi quality! Recommended product. 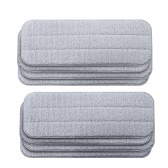 Very useful product, fast shipping!! Super, thank you, very fast shipping. 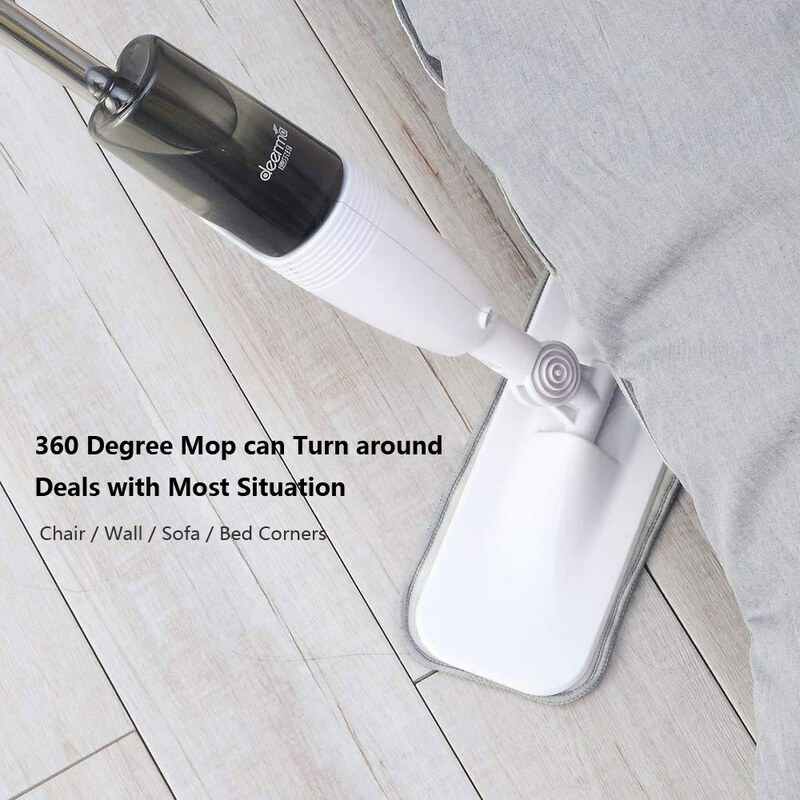 Mop is dripping water while cleaning. 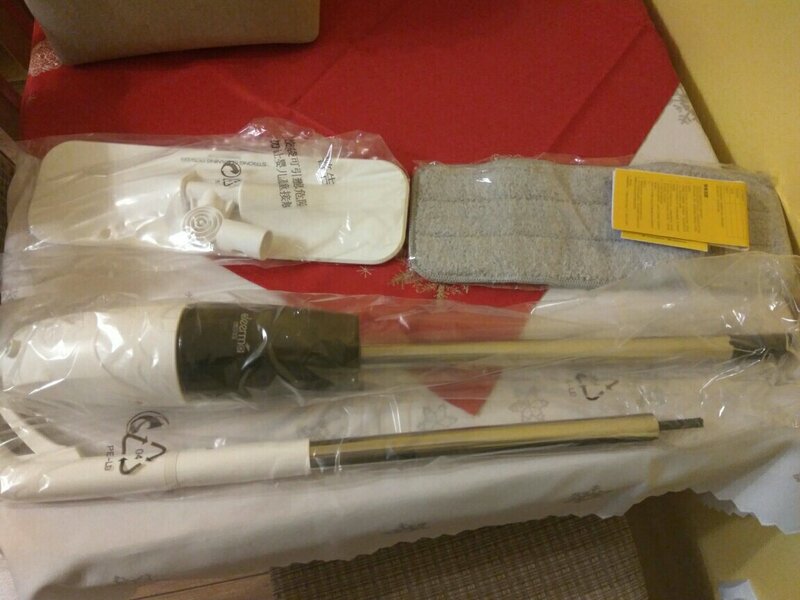 It was probably used before because packed mop cointained small amount of water in water box.